My Grammy (known as Elsie to everyone but her grandchildren) was born in Oakland, California in the spring of 1913, the first child of her mother El (short for Elsie). "Little Elsie" grew up in the thriving and bustling metropolitan San Francisco East Bay Area with a large extended family living locally including her mother's sister, Esther, and her father's sister, Maggie. Back then even city lots had room for vegetable gardens, fruit trees, and chicken coops. El's husband Bill (known to his granddaughters as "Grandad") was an avid gardener throughout his life. Living in the mild Bay Area climate meant he could have a year-round garden. So El's kitchen most likely used a lot of freshly grown veggies, fruit from the fruit trees, fresh eggs from the hens, and home-raised poultry meat. 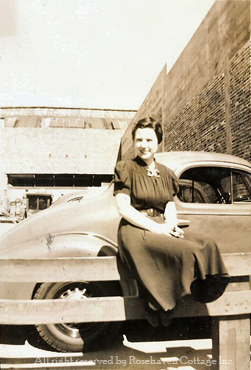 During the 1930s, Elsie was a twenty-something single working woman in downtown Oakland. That is probably about the time she acquired her recipe box because it has her maiden name initials on the front. 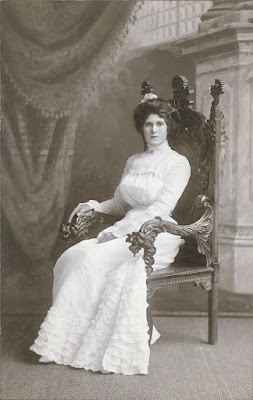 She didn't marry until her late 20's, so I'm sure she spent a good deal of time cooking for herself, her father and her brothers (her mother, El, had passed away when Elsie was only 14 years old). 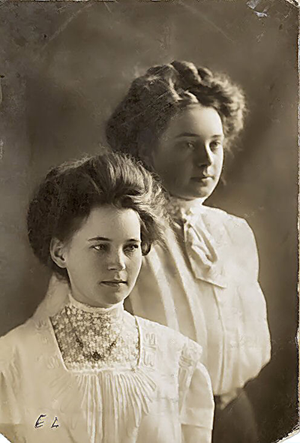 Elsie and her Aunt Esther were close both in proximity and spirit. It's little wonder why there are recipes in the box that are in Esther's handwriting as well as El's. I've been able to identify Esther's handwriting using as comparison points a few dated recipes that are clearly identified as Esther's. Elsie married in her late 20's. 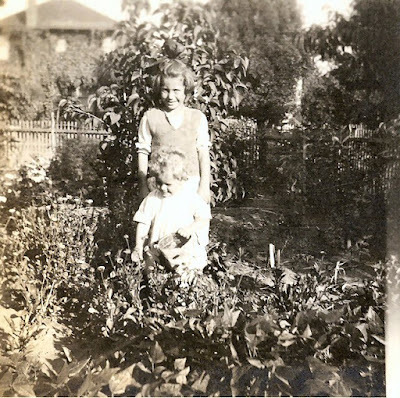 She and my Grampy (Jake) stayed in Oakland for a few years where their first two children were born. Then in the late 1940's, Jake and Elsie moved their family to the logging country of northern California. Their new home would be an old miner's cabin that had been moved onto a town lot in a logging community of barely over 1,200 residents. Elsie's lifestyle changed dramatically in many ways. The differences in her kitchen must have been profound. I can imagine that going from an elevation of near sea-level with the conveniences of a modern kitchen to a mountain elevation of 3500 ft. above sea-level in an archaic kitchen had to create some interesting results with cooking and baking. In those early years the home's only sources of heat were an old wood-burning stove and a big kerosene heater in the living room. It was Elsie's responsibility to get up on frigid mountain mornings, build the fire, and start breakfast. 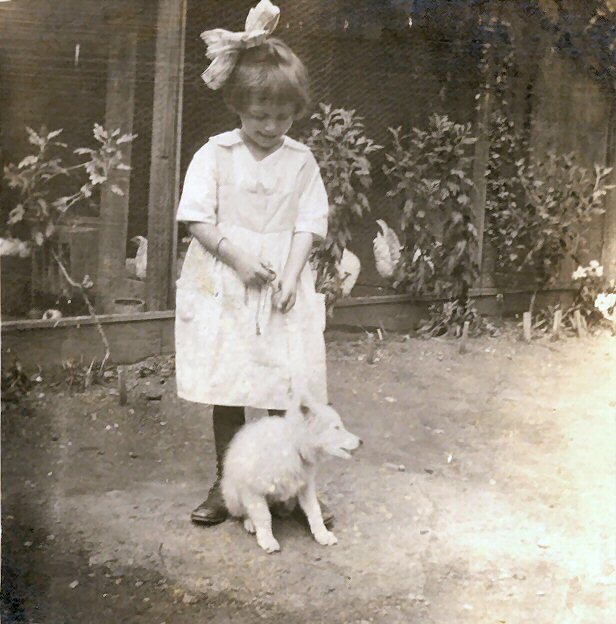 She was also responsible for raising the chickens out in the yard. And when Jake butchered one, it was Elsie's job to pluck and prepare the chicken for meals. It was one of her least favorite responsibilities. For the rest of her life, Grammy cooked at that higher elevation in the secluded Indian Valley. 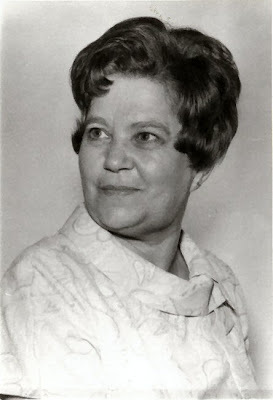 When I came along as her first grandchild in the 1960s, she was very settled in her mountain locale. A few years prior to my birth, Grammy oversaw a lovely, yet modest, renovation of the small kitchen to be all red and white. That red and white kitchen is the one I remember visiting as a child. A newer four-burner propane stove had replaced the original wood burning one. But I still got the experience of smelling a wood burning stove in her kitchen because after Grammy got the new propane stove she missed the warm feeling of an actual fire so much she bought a narrow wood burning "trash burner" unit that sat snugged up to the left of the new stove (you can see it in the photo below). There was no formal dining room in her home—just a kitchen table next to the stove. 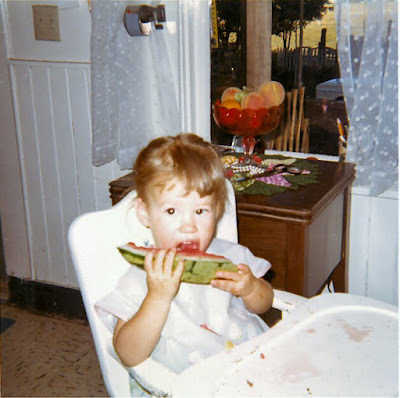 I loved sitting there at the table while my Grammy, my mother, or one of my aunts worked around me. 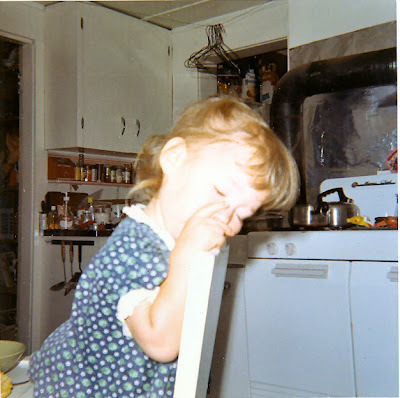 I especially loved when the stove was on with the warmth and smells radiating from it, and I was always mesmerized watching things being burned in the "trash burner". It was especially enjoyable on a chilly mountain spring morning when bacon and eggs were cooking in an iron skillet on the stove and wood was burning in the "trash burner" unit. It smelled like camping except I was snug inside my Grammy's kitchen. Sometimes I even got to help out with the cooking. I don't know how much of a help I was, but I do know that those moments they allowed me to be a part of the cooking made me feel special and loved. I learned from those patient women how important it is to involve even the littlest of chefs in the cooking process. I have been happy to see my mom and her sisters carry on that tradition with their grandchildren. As a little girl I would sit at the kitchen table and look out a large picture window onto the yard to the west. The windows were framed in gauzy white curtains that fluttered in the breeze from windows opened to keep the kitchen aired out. The smells of cooking would blend with the aroma of the pine trees and the hint of wood fires from the sawmill in the distance. To this day, those smells take me straight back to my Grammy's kitchen. west-facing window that is out of the frame to the right. The screen door to the back porch was just out of the frame to the left. A screen door led straight out the back of the kitchen onto a covered porch where I could go in and out. To this day, the bang of a wooden screen door reminds me of Grammy's kitchen. 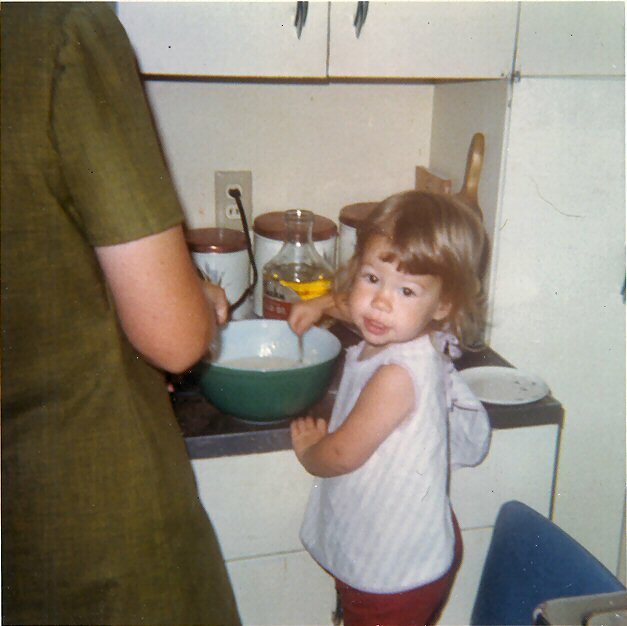 As I've skimmed over the older recipes in her recipe box, I've found it interesting that many of the oldest recipes are ones I never recall Grammy making during those years I was privileged to spend time in her kitchen. I think it may be possible that many of the older recipes simply didn't work at a higher elevation using a wood-burning stove. The recipes I do remember are ones that were copied and recopied into first my mother's recipe box and then my own. Interestingly, there was a 4 year period during my childhood when my mother had to cook at an even higher elevation then the one to which she had grown accustomed growing up in the Indian Valley. For a time, her recipe box was even more pared down then Grammy's. It was shortly after that 4 year time period of limited cooking options, that we moved back to a lower elevation in the San Franciso Bay Area, only a few hours' drive from Grammy's house. That move happened in February of 1977. By Mother's Day (in May) my Grammy was gone, her life cut short by ovarian cancer at the age of 64. I was 10 years old when she left this world. I had lost one of my best friends. We understood each other in the way kindred spirits do—unspoken and intuitively. My mother and her sisters agreed that I should get Grammy's recipe box. I've kept it all these years. Mostly, I've kept it closed, opening it every so often to finger the cards written in my Grammy's handwriting—not to actually make up any of the recipes. Then a couple of years ago, thanks to my adventurous husband (who is a phenomenal cook) I started looking at the recipes with new eyes. I started to feel an urge to try my hand at making them. I didn't know El and Esther personally, so I hadn't learned their baking and cooking secrets standing by their side in the kitchen as would have been ideal. I don't remember much of what my Grammy did in the kitchen either. But I have these recipes. And somehow, with my husband's help, I hope to resurrect their kitchen secrets by cooking our way through them all. 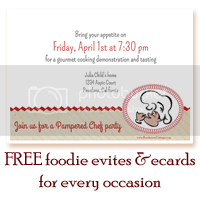 This blog chronicles our adventures as we attempt to rediscover antique and vintage recipes from Grammy's recipe box.